The Bank of Latvia have issued (31st August) their latest gold coin, which is part of an ongoing annual series entitled “Gold Brooches.” The series was launched last year with the first coin replicating a third- to fourth-century disc fibula. The series looks to highlight some of the country’s ancient and medieval history through its brooches. 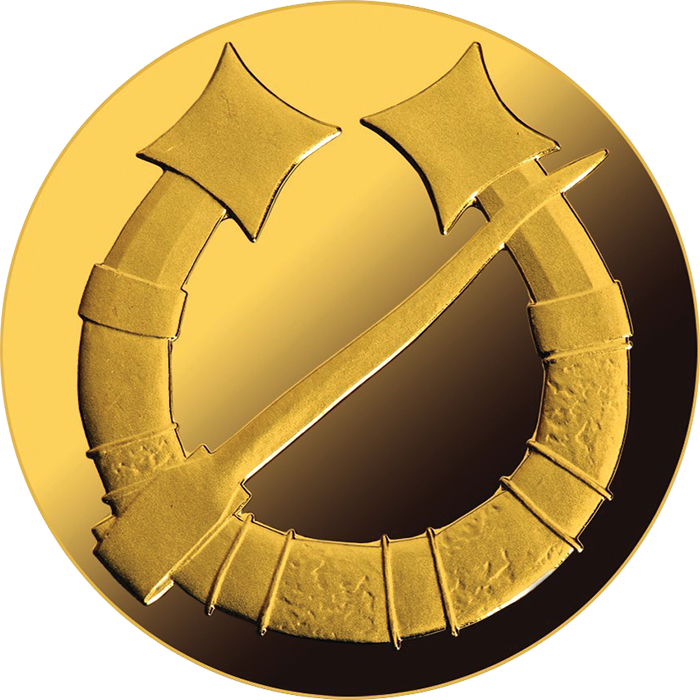 The brooch image of the coin is based on a 12th-century horseshoe fibula cast in bronze which, together with other artefacts, was found in cremation graves of the Upīši ancient burial field located in Gramzda civil parish. It was traditionally worn by Couronian men. This was the most popular type of ancient brooch and has been used on the territory of contemporary Latvia for almost 1,000 years. They became a typical adornment in the Late Iron Age (9th–12th century), when they were cast in bronze, iron, and silver. Horseshoe fibulae were used by both men and women. The history of the brooch in the territory of Latvia began with various brooches from the early Iron Age (1st–4th century): the so-called eye fibulae, tutulus fibulae, and cross-ribbed fibulae. Only toward the end of the 17th century were the horseshoe fibulae completely replaced by the ring fibulae. The arbalest (or crossbow design) and fibulae (or round disc fibulae) with openwork wheel were the prevalent design during their height of popularity. The older brooches were imported, but soon the local craftsmen began to use them as models to make their own brooches, with their form and creativity reflecting the local aesthetic and cultural concepts. Brooches were used to fasten and adorn clothing by all: men, women, and children among all classes of society. The form and ornamentation on brooches also served a protective function (jewellery as an amulet). The form, size, function, and material may have changed, yet the brooches have remained popular until the present day. The coins are produced by the Mint of Austria on behalf of the Bank of Latvia and their design is the work of artists Ingūna Elere and Solvita Rulle. The reverse features a stylised image of a 12th-century horseshoe fibula with star-shaped ends. 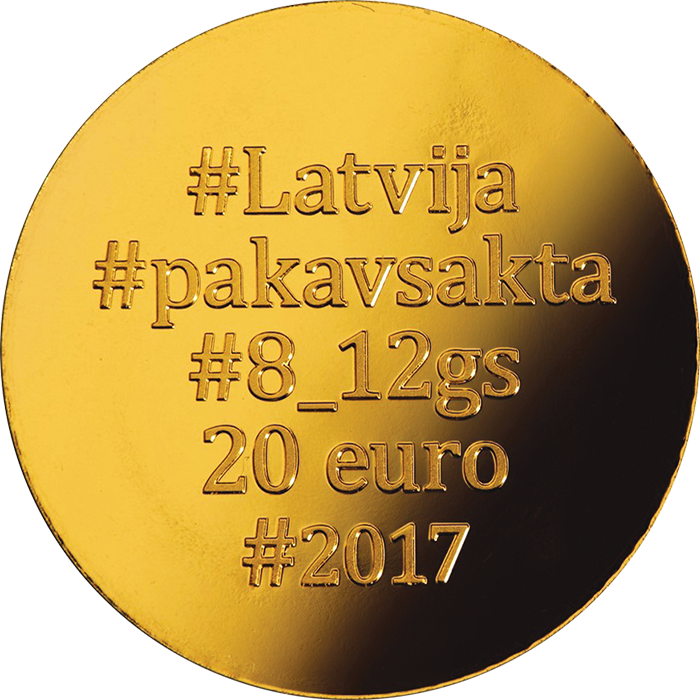 The obverse side is unique in the sense that it includes only “hashtags” as part of the aesthetic design: #Latvija, #pakavsakta, #8_12gs, 20 euro, and #2017. According to the concept of Ingūna Elere, the brooch featured on one side of the coin provides centuries-old information. The brooch tells us a story about ancient times in Latvia’s history. The hashtags on the other side highlight the times we live in, how we communicate in the virtual environment and social networks, and how we select topics important to us. The coin replicating the horseshoe fibula with star-shaped ends continues the series of Euro gold collector coins dedicated to Latvia’s centenary of independence. 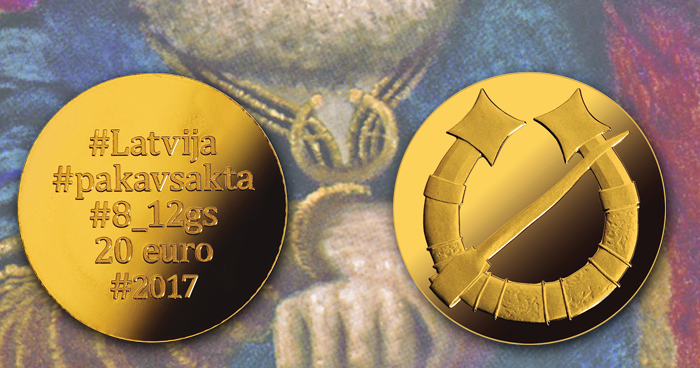 In 2018, Latvia’s actual anniversary year, this series will be concluded with a golden collector coin replicating a bubble fibula. The coin is available and on sale at Latvijas Banka Cashier’s Offices (K. Valdemāra iela 1B in Riga and Teātra iela 3 in Liepāja), as well as online via Latvijas Banka’s collector coin website.